As confidence leaps go it’s a huge one, the uphill, unsighted right-hander climbing out of a bomb-hole that’s similar to the ‘Seca Corkscrew in gradient, and no less challenging. We remember it well, the 911 Turbo feeling flighty at the peak, requiring every bit of nerve to keep it lit and ride out the slight transition to oversteer at comical speeds – just as the suspension lifted and gravity’s hold was relinquished by the force of a turbocharged flat six and the crest of a right-hander. 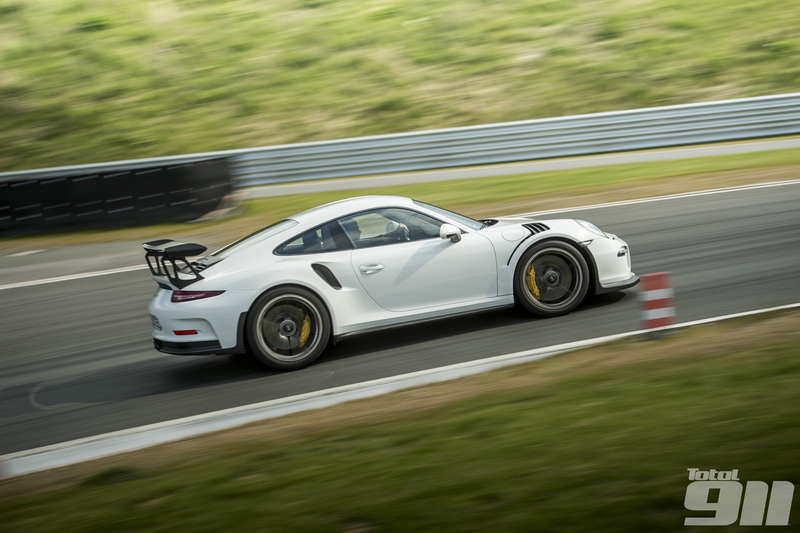 In the new GT3 RS the corner is no less senior, but very different. The homologation hooligan’s aero makes all the difference and keeps it tidier, even at the same speeds that the 991 Turbo managed. We’re at Bilster Berg, Germany, which is a challenging track for any car and driver. We’ve been here once before in that Turbo (and Turbo S), and now there’s a Porsche reprise, as it’s where we get our world first drive in the 991 GT3 RS. There are some worried-looking faces from the Porsche hierarchy that the rather tight, heavily cambered track might not be the best place to demonstrate the GT3 RS’s entire repertoire. And for the first time ever in a Porsche event, there’s an edict that the stability and traction control systems are to remain on. Is this a tacit admission that the GT3 RS is a handful? The discussion prior to our test is that the GT3 RS is, and has to be, more distinct than the GT3. In the metal, it’s most certainly true: that much is obvious from the looks alone. There’s no badging and no fancy contrasting livery to denote this limited-run RS model. It doesn’t need it. Twice we’ve seen the 991 GT3 RS on motorshow stands, but nothing prepares you for the visual assault the modified, lighter, magnesium-roofed, bewinged and vented Turbo-bodied RS represents. More than ever before, the RS looks like it’s been de-numbered after an endurance race. To read our pulse-racing first drive of the awesome new Porsche 991 GT3 RS in full, pick up Total 911 issue 128 in store now. Alternatively, order your copy online for home delivery, or download it straight to your digital device.